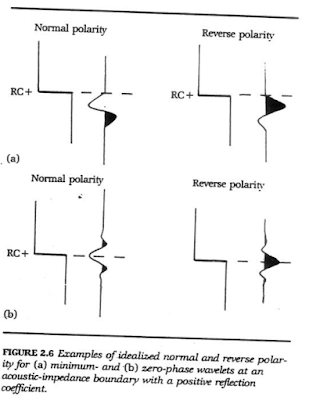 Which one wavelet that is easy to interpret and correlate with increasing impedance/RC ? 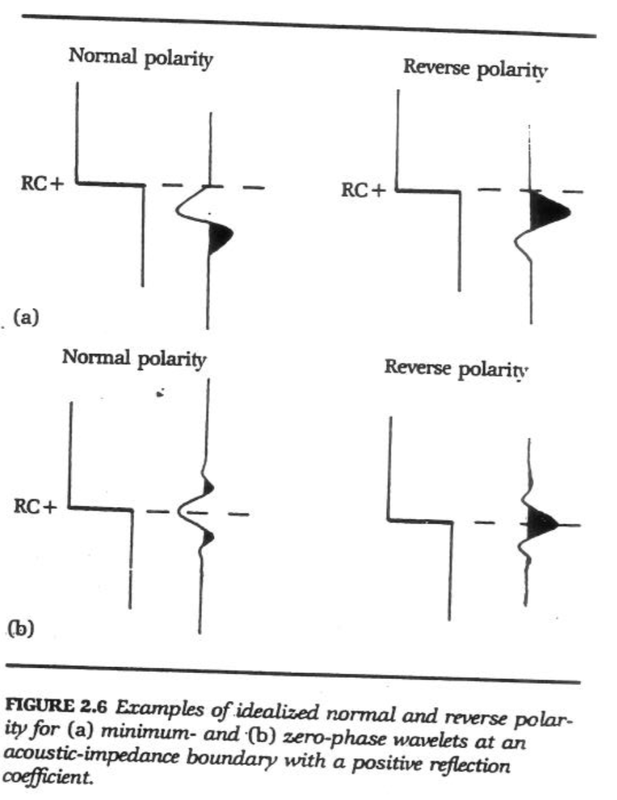 The answer is minimum phase Ricker wavelet reverse polarity, because it is consistent with increasing impedance and interval velocity values. The offset range is one of the most important attributes. Without an adequate offset range in the bin, the bin is useless for velocity analysis and probably will be a poor stack trace. Near traces represent the best approximation to the zero offset for depth conversion. The middle traces connect the near and far traces for defining the move out hyperbola. In some case, the middle traces contain the best image of the target. The far traces are absolutely essential. Without the far traces there is not enough moveout on the traces to determine the velocity. Other techniques, such as AVO, cannot be applied without the far traces. When a minimum phase wavelet in normal polarity ('a' in picture) strikes a contrast impedance medium then it could be marked in near trough for increasing impedance medium in earth. When a zero phase wavelet in normal polarity ('b' in picture) strikes a contrast impedance medium then it could be marked in centre of trough for increasing impedance medium in earth. In certain circumstances, it can be a powerfull asset to seismic facies analysis to describe properties such as reflection continuity, frequency and amplitude. Unless there is high well density, these attributes are highly qualitative. 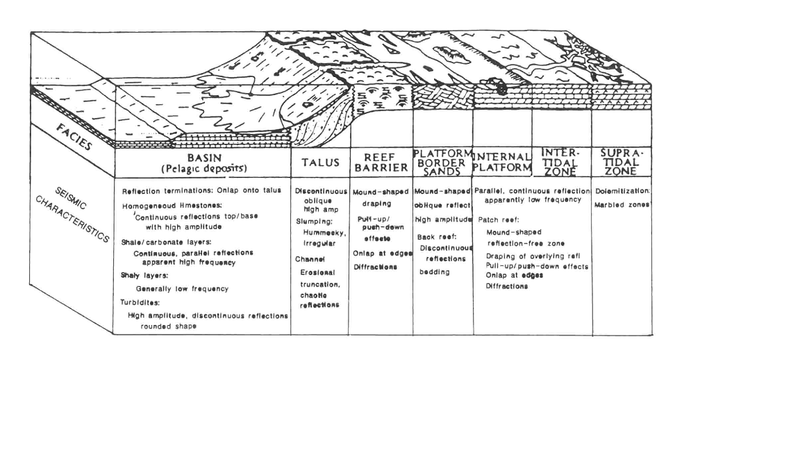 Continuous reflections imply uniformity of lithology and discontinuous reflection imply laterally varying lithologies. 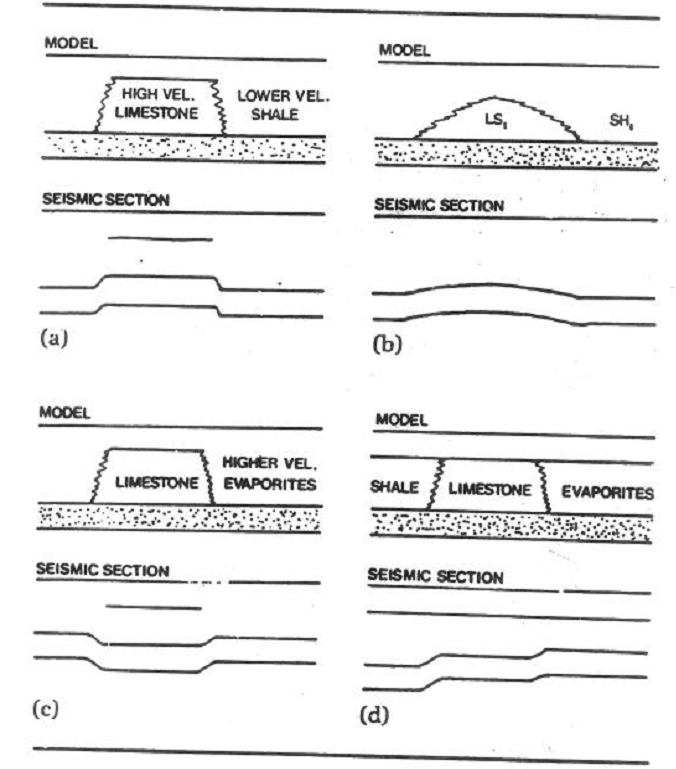 Reflection continuity is highly prone to interference of noise and multiples, and it's easy to 'over-interpret' lateral and vertical variations in continuity and ascribe genuine lithological reasons for the variability when processing or acquisition artefacts are to blame. 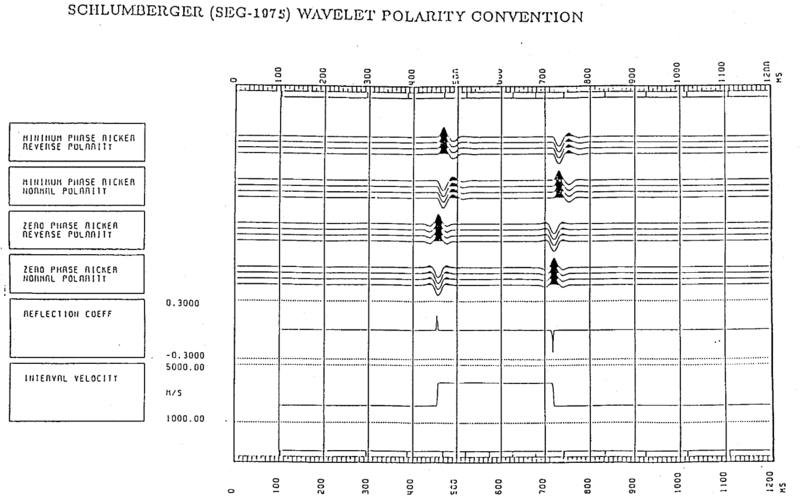 Peg-leg multiples generated in an overlying horizontal sequence can produce discontinuity in an underlying dipping continuous sequence simply by interference. These pitfalls also apply to the generation of false onlaps and downlaps particulary in sequences with low signal to noise ratio. 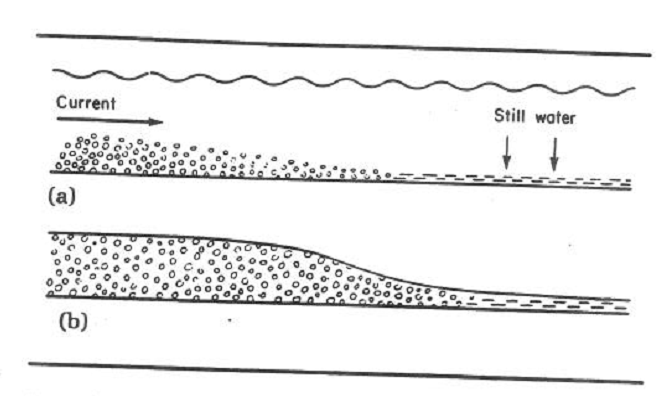 Growth faults, at shallow depths in soft ductile sediments, may have a better capacity to trap hydrocarbon than post depositional faults at depth in more indurated (brittle sediments). In Nigeria, hydrocarbons are trapped in the downthrown side of growth faults when they are juxtaposed against an overpressured shale zone on the high side. The distribution of porosity, permeability, and other properties over the area of a reservoir are incorporated in a reservoir simulation model. The models are updated as additional information becomes available. The validity of a model is judged by how closely actual results (fluid-flow rates, bottom-hole pressuress, and so on) match predictions based on the model. A general rule of thumb is that a model can be used to predict reasonably well for about the same length of time as it has matched past history. Scenarios of production programs and strategies (for example, varying the number of wells and their locations, preferentially producing different wells, injecting water or gas to enhance the drive, and so on) are run on the model to determine how to optimize the economic return. Obviously, very realistic maps and data are required to achieve this end result. 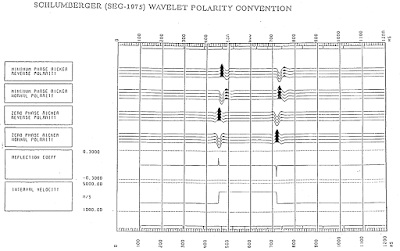 The traces of the upgoing VSP are often stacked together to yield the pattern of primary reflection for correlating to conventional seismic data. Corridor stacks are usually better than synthetic seismograms made from well-log measurements for relating reflections to interfaces because the measurements are made at seismic frequencies and are not sensitive to logging uncertainties. The slope of the first breaks VSP (direct-wave traveltimes) gives the velocity. Reflections have a slope opposite to the first breaks. By using this difference, it is possible to separate downgoing waves (which consist of direct waves and multiples involving an even number of reflection) from upgoing waves . The upgoing waves may be 30dB below the downgoing waves. 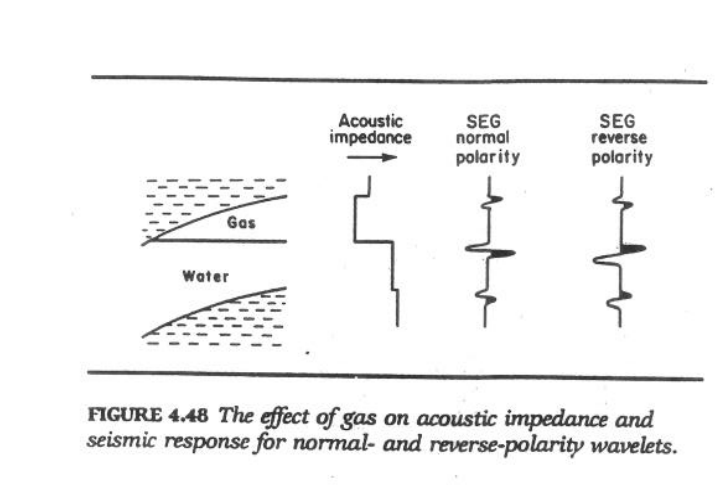 A lowering of instataneous frequency is often observed immediately under hydrocarbon accumulations. Such "low-frequency shadows" seem to be confined to a couple of cycles below (not at) accumulations. No adequate explanation is available, proposed explanations generally involve either the removal of higher frequencies because of absroption or other mechanisms, or improper stacking because of erroneous velocity assumptions or raypath distortions. 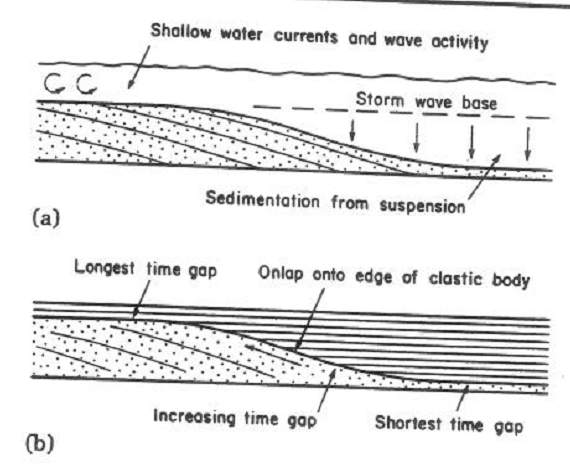 Onlap indicates locations that are proximal (deposition close to the source of sediments, that is, on the landward side of a sediment package) and downlap locations that are distal (deposition distant from the sediment source). It is rare that the correctness or incorrectness of an interpretation can be ascertained because the actual geology is rarely ever known in adequate detail. The test of a good interpretation is consistency rather than correctness (Anstey, 1973). 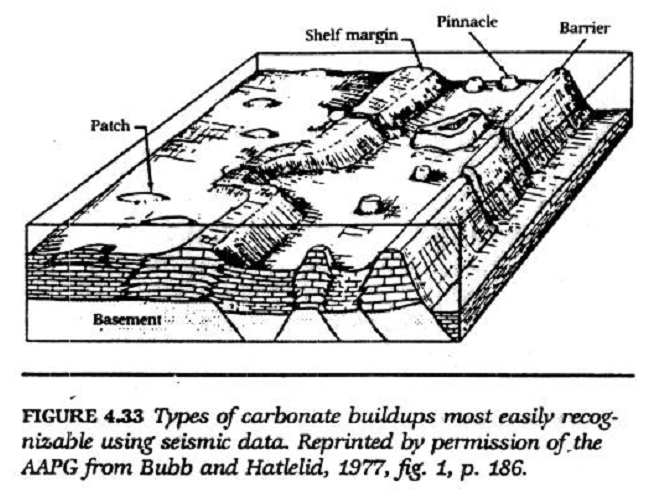 Not only must a good interpretation be consistent with all the seimic data, it also must be consistent with all that is known about the area, including gravity and magnetic data, well information and surface geology, as well as geologic and physical concepts. One can usually be consistent and still have a choice of interpretations, the more so when data are sparse. The interpreter should explore various possibilities, but usually only one interpretation is wanted, that which offers the greatest possibilities for significant profitable hydrocarbon accumulation (assuming this is the objective). An interpreter must be optmistic, that is, he must find the good possibilities.whereas a nonoptimistic interpretation may result in abandoning the area. Management is usually tolerant of optmistic interpretations that are disproven by subsequent work, but failing to recognize a possibility is an "unforgivable sin." Reference : Sherrif, 1995. Exploration Seismology. To do quick QC of Seismic processing, assumed that we are a geoscientist in Oil Company reviewing the progress of processed seismic by vendor, is to look the prestack seismic sorted into CMP gathers. 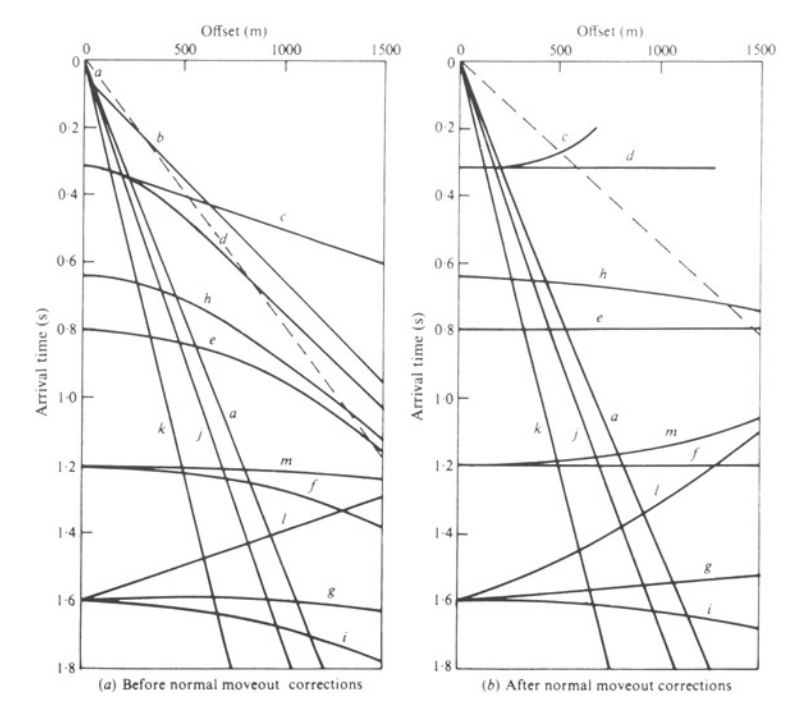 (a) Weathering and elevatation static corrections, because the correction is the same for all arrival times on a given trace. Provided the correct normal moveout has been removed, reflections appear as straight lines, whereas diffractions and multiples still have curvature, becuase their normal moveouts are larger than those of primary reflections, and refractions have inverse curvature.